More than two years have passed since the war between Russia and Georgia, and the casual observer might be deluded into thinking that the situation in the South Caucasus has reached a new, stable equilibrium. Russian tanks are firmly ensconced in the two Georgian breakaway regions, Abkhazia and South Ossetia, which Russia and three other states now recognize as independent. Those tanks are not pulling back anytime soon and will deter any rash Georgian efforts to take back their territories by force. The Russian military presence in internationally recognized Georgia is an irritant for Russia’s relations with the West, but it is not an impassable roadblock. Some point to North Cyprus, which complicates Turkey’s European Union membership aspirations but does not prevent cooperation with the West, as a “model.” In other words, get used to the status quo, since it will be here for the long haul. This status quo in the South Caucasus, however, is not sustainable. The reason: it satisfies none of the parties in the conflict, including Russia. And it is a situation that could easily, and rapidly degenerate given the lack of effective tools for preventing renewed conflict—in particular on the South Ossetian side, where local authorities have pulled out of the existing Incident Prevention and Response Mechanism, or IPRM—a multilateral early warning system. There is also an unstable environment along administrative lines between the regions and the rest of Georgia, where cross-border detentions, thefts, and kidnappings have become regular occurrences. If the tentative peace deteriorates in the South Caucasus, the humanitarian, strategic, and domestic-political consequences (say goodbye to New START ratification) would be disastrous. But the situation presents the Obama administration with an opportunity given that no party to the conflict—not Abkhazia, South Ossetia, Russia, nor Georgia—is reconciled to today’s reality. The United States currently lacks a comprehensive policy on the conflict, one that could accomplish four key objectives: preventing a future outbreak of violence; managing the humanitarian situation on the ground; reducing the conflict’s role as a roadblock to cooperating with Russia on other critical security issues; and facilitating the reunification of Abkhazia and South Ossetia to Georgia in the long term. Discussion in Washington on these issues has unfortunately devolved into a farce. Analysts and commentators are not debating how the United States can practically achieve these goals, but rather arguing about the merits of “taking a stand” and “showing support” for Georgia—positions that the Georgian government desires and actively inserts into the U.S. domestic foreign policy debate, but which hold little hope for changing the situation on the ground. Would a meeting between Georgian President Mikheil Saakashvili and U.S. President Barack Obama at the April Nuclear Security Summit have sent those Russian tanks rolling back north? Would a U.S. declaration that the Russian military presence constitutes an occupation under international law make Putin rethink his policies? And would the “antitank capabilities, air defenses, early-warning radar, and other defensive systems” that Sen. John McCain (R-AZ) has called for really bring stability to the region or deter a potential future Russian invasion? The answer to all these questions is clearly no. Calls for arms sales to Georgia in particular have become more and more vociferous, both from the Georgian government and the Obama administration’s critics. But the administration’s continuation of an (unspoken) policy dating from the Bush era of not authorizing the sale of serious military hardware to Georgia rests on a conclusion that the Georgian armed forces lack the capabilities to be able to use the weapons safely and responsibly. Questions also linger about the judgment of Saakashvili and his government when it comes to the use of force, especially after the EU-commissioned report on the August 2008 war suggested that the country’s highly centralized decision-making processes were a major factor leading to the rapid escalation of violence. In other words, there are good reasons to conclude that arms sales would actually further destabilize the situation, not improve it. It is true, however, that the Obama administration’s policies have yet to produce a breakthrough. The administration provides a massive amount of financial assistance to Georgia and, like all administrations before it, counsels “strategic patience”—the notion that Georgia will eventually entice Abkhazia and South Ossetia into closer association or even incorporation through comparatively attractive political, social, and economic development. The U.S. government at the same time sternly repeats to Russia the mantra of “abide by your international commitments,” in this case the ceasefire agreement which states that all forces should withdraw to pre-war positions and numbers. But the Russians say that they fulfilled the agreement—the forces that fought did withdraw; it’s just that new ones took their place. And they say the document was signed in a world where the “independent states” of Abkhazia and South Ossetia, which now have basing agreements with Russia, didn’t exist. That world, they explain, is no more. The United States is also involved in regular multilateral consultations in Geneva on the conflict, which sound like painfully tedious affairs: face-to-face reiteration of vehement disagreements and dramatic walkouts by Abkhazian and South Ossetian representatives. But despite these efforts, current U.S. policy has not done much to further the conflict prevention or management goals. A realistic discussion about the conflict, to say nothing of an effective conflict policy itself, must begin by acknowledging that Russian cooperation is necessary for progress. Neither Washington nor Tbilisi are in a position to strong-arm Moscow into making concessions on this issue. The Obama administration has made a conscious decision not to condition other aspects of the U.S.-Russia relationship on progress on the conflict—a sensible policy given the multitude of critical security issues on the bilateral agenda. And Georgia’s structural power asymmetry will forever deny it the upper hand. In other words, viewing the discussion with Russia in terms of leverage, demands, and concessions is a dead-end. The current approach of pushing Russia to comply with a ceasefire treaty that it considers null and void has little chance of achieving results, at least in the short to medium term. Returning the South Ossetians to the existing Incident Prevention and Response Mechanism without conditions or delay. An elaborated nonuse of force agreement signed by all parties to the conflict: Russia, Georgia, South Ossetia, and Abkhazia. A monitoring visit to the South Ossetian side of the administrative line by international representatives—preferably from the existing EU Monitoring Mission—followed by periodic, scheduled visits if successful as an interim step toward the ultimate aim of providing regular monitoring access to both South Ossetia and Abkhazia. A softening of the “border control” regime to provide for secure but free movement of people, transportation, and goods across administrative lines, especially for the Akhalgori region of South Ossetia. This would ideally involve replacing the current Russian-run system with one manned by Georgians, South Ossetians, and Abkhazians with international assistance. Multilateral discussions on reconstruction, restitution, or return for all those who suffered from conflict in 2008 and in the South Ossetian conflict of 1989-1992, followed by eventual talks on the thornier issues of displaced people from the Abkhazian conflict of 1992-1993. A voluntary freeze on buildup of Russian military forces in the territories. 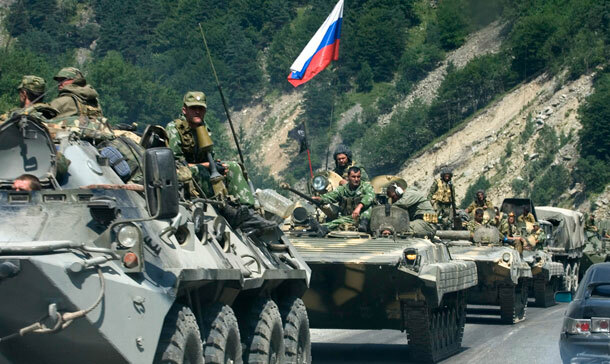 Withdrawal of Russian troops from Perevi, a village acknowledged by all to be outside South Ossetia. These steps are explicitly not tied directly to a desired end state. Conflict resolution remains the ultimate goal, but what is most important now is preventing renewed violence, managing the impact of the conflict on people’s lives, and achieving some tangible progress. Some measure of momentum would go a long way to reassuring the Georgian government that the United States takes this issue seriously, which might prevent rash moves, such as the War of the Worlds TV broadcast in March, which portrayed a fake Russian invasion during the evening news. We can expect the Russians to take this overture seriously because it would bring at least tacit recognition that some measure of Russian military presence in Abkhazia and South Ossetia is inevitable in the near term. It would also make clear that conflict prevention, management, and resolution represent a collaborative effort that is about more than Russian concessions. But the most significant reason why progress might now be possible is Moscow’s discontent with the current situation. South Ossetia remains a black hole for the Russian budget despite numerous high-level visits, installation of native Russians in the local government, decrees banning middlemen, and other budgetary oversight measures. The leadership there has become adept at stealing millions of rubles that Moscow has committed for reconstructing the region. The government in Abkhazia, by contrast, is entering more and more into conflicts with Moscow, in particular over the restitution of property to Russians who claim that their property was expropriated by Abkhazian authorities. A group of these Russians has actually sued the Russian Ministry of Foreign Affairs for its failure to defend their property rights. Following an initial dismissal, the group appealed and has threatened to take the case to the European Court of Human Rights if the Russian legal system does not provide them justice. Prime Minister Vladimir Putin confirmed Russia’s ambivalence with his recent answer to a question about the region’s future at a meeting with experts on September 6 in Sochi. He said that Georgia, Abkhazia, and South Ossetia will have to work together to determine the future character of their relations. He added that he didn’t know what form those relations would take, saying, “I can’t say whether it will be inter-state or not.” In other words, he suggested that the reincorporation of the territories is not out of the question. There was no talk of the eternal independence of Abkhazia and South Ossetia. Other senior Russian officials portray the decision to recognize the two regions as having been forced on them by the military brass who demanded a legal footing (those basing agreements) for their long-term presence. The policy implications of the change in Moscow’s tone remain unclear. Putin has certainly said a lot of things over the years that have not translated into actions. But we in the West need to recognize that changing Moscow’s calculations by pursuing conflict prevention and management as shared interests is far more important than “taking a stand for Georgia” when it comes to improving the untenable situation in the region. Arms sales are not the answer. Samuel Charap is Associate Director for Russia and Eurasia at the Center for American Progress. Cory Welt is associate director of the Institute for European, Russian, and Eurasian Studies at The George Washington University’s Elliott School of International Affairs.